In a little less than 21 days, you’ll stand in front of a room full of people and make the most significant commitment of your life. Most wedding magazines and websites will tell you it’s “crunch time,” and you might start to believe them. For me, I go back and forth. One minute I feel like I need to be crash dieting, the next I take a deep breath and tell myself “just enjoy”. Weddings are about so much more than society tends to teach us. I’ve been talking to Nathan a bit about it the last few days, and we’ve talked about different expectations on men and women with regards to weddings. I think it’s a mix of cultural and personal things that have led me to believe that I need to look perfect on my wedding day. If I’m not my perfect weight, or I didn’t pick the best dress, or my hair isn’t right…then somehow, I have failed. I’ve failed as a bride and I’ve failed as myself. What kind of a mixed up message is that? I don’t even consciously believe that and I definitely don’t agree with that message, but that’s the pressure I am feeling at my core. And it makes me really sad. 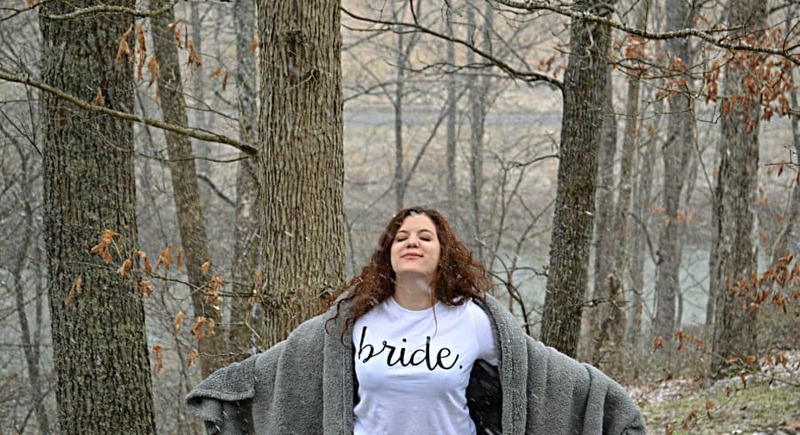 Why do we live in a world where the bride is told to focus primarily on her appearance? That is not what the wedding day is about. Even if I want to look beautiful and feel like a princess, it shouldn’t be the case that 10 extra pounds makes me feel like I haven’t succeeded. I should be allowed to feel beautiful and do so own my own terms. But in a world that glorifies tiny, perfect bodies it can be hard to do so. So here is my plan for tackling the next 3 weeks, and I’ve come up with ways you can do so too, if you too are a bride-to-be. I guess I am fortunate in that I never turned into a Bridezilla. The wedding planning itself has never stressed me out too much, and I don’t get bogged down about linen colors or other details. But for some brides, the details are really important. If you’re in the early part of planning a wedding, I’d urge you to let go as much as possible of the need for your wedding to be perfect. It’s one day of your life and it is about so, so much more than centerpieces. If you know you’ll be obsessing down to the last minute about wedding planning, try to get all major tasks done far before the wedding. That way, even the most type-A of brides can take time to relax and enjoy herself in the weeks leading up to the wedding. You don’t want to be putting together DIY favors the night before your celebration! What if there are 2 or 3 weeks left until the wedding and you still have A TON to do? At that point, let it go my friends. You can only do so much. Delegate when possible, or just move on. Another myth our society feeds us (damn you, SOCIETY!!!) is that on your wedding day you should be 100,000% sure that you’ve met your soulmate, the key to your heart, the love of your freakin’ life. If you have doubts, society says, don’t do it. How not comforting is that? Essentially, our beliefs state that we should have zero doubts and feel at our pinnacle of happiness. However, most brides and grooms don’t feel this way. Human beings are complex, deep creatures. We rarely ever feel 100% about anything, and doubts are really normal. I think it is completely typical to have some doubts, even leading up to your wedding. After all, you’re making the biggest commitment of your life, hopefully FOR life. Why wouldn’t you panic a little at the enormity of it all? If your wedding is weeks away and you’re feeling a sense of anxiety about getting married or about your choice of life partner, take some time first of all to take care of yourself. Be sure you’re eating healthy, sleeping well, and getting exercise. Take time for solitude and relaxation. Then, come at your doubts from a place of balance and wisdom. Make a gratitude list if you feel like it. Even if doubt or anxiety is irking you, you chose this person for a reason. They are not perfect, no, nor will they ever will be. And nor are you. But this imperfect, beautiful soul with all their flaws and foibles wants to share their life with you. That is an incredible gift and together you will grow, learn, and have amazing experiences. Keep reminding yourself of that and soaking it in. And if you feel doubt, just let it be. It’s not going to dictate your choice to join your life to this remarkable person you love so much. Ugh. For anyone out there who feels despondent that they haven’t lost enough weight leading up to the wedding, I hear you. My exercise has not been what it could be, and though my diet is healthy, I slip up more often than is ideal. I haven’t been that strict with myself in the past few months. But I realize, it’s because I haven’t wanted to be. Though my mind knows that losing 15 pounds would be awesome, I think my heart knows that I’d rather drink the occasional latte and not get so obsessed about counting calories and weighing myself every morning. For me, it’s been a tough road when it comes to body image, and it would be really easy for me to teeter across the line into obsession and disordered eating. So ultimately, I am happier when I approach food from a place of balance. I am also happier when I eat healthy. Good, real food, makes me feel energized and satisfied. But here I am, a few weeks from the wedding, and I have a choice. And if you’re a bride, so do you. I could go on a crash diet, subsisting on 500 calories a day and exercising like crazy. It would be effective, yes, but I would be miserable. I might be several pounds thinner by the wedding, but I’d be far more likely to end up stressed, in tears, and possibly binge eating Reese’s Puffs cereal. The second possibility is to say “screw it” and eat whatever the heck I want. The final option is to simply eat as healthy as possible, drink plenty of water, avoid sweets and excess carbs, and exercise daily. This third option is the one to choose, it’s very clear. I can’t dramatically change my body in 2-3 weeks. If I could, I’d be doing so dangerously and painfully. Instead, I will love the body I have now, and treat it like a freaking queen. With 2 weeks of delicious, healthy foods, plenty of water, and physical activity, I’ll not only look my best, I’ll feel my best by the wedding day, and really state of mind is half the battle. Don’t let weight, wedding planning, or anxiety keep you from living in the moment of one of the most important occasions of your life. It’s not about the wedding…it’s about the marriage. You are going to glow on that day no matter what, because you’re clasping hands with the one you love to join together forever and walk hand-in-hand towards all the adventures life has in store.